Famously known as The City of Palaces, it wouldn’t be wrong to say that Mysore is one of the most flamboyant places in the country. It is replete with the history of its dazzling royal heritage, intricate architecture, its famed silk sarees, yoga, and sandalwood, to name just a few. Located in the foothills of the Chamundi Hills, Mysore is the third most populated city in the state of Karnataka, and its rich cultural heritage draws millions of tourists all year round. Mysore is steeped in royal history – it was one of the three largest Princely States in the erstwhile British Empire of India. To this day, the Mysore Palace stands tall as one of the most spectacular palaces all over the country. A very famous tourist spot that sees thousands of visitors milling in and around it every day, the Mysore Palace is renowned for its architecture, design, artisanship and ancient upholstery. A mesmerizing example of Indo-Saracenic architecture, every inch of the palace drips with opulence and intricate details, and every room that you visit stands out in terms of its elaborate architecture, beautiful paintings, rich colours and stained-glass windows. On every Sunday, and during the Dussehra celebrations, the palace is spectacularly lit up once dusk falls. Ambavilas Palace otherwise known as the Mysore Palace is a historical palace and a royal residence at Mysore in the southern Karnataka state of India. It is the official residence of the Wadiyar dynasty and the seat of the Kingdom of Mysore. The palace is in the centre of Mysore, and faces the Chamundi Hills eastward. Mysore is commonly described as the 'City of Palaces', and there are seven palaces including this one; however, 'Mysore Palace' refers specifically to this one within the Old Fort. The land on which the palace now stands was originally known as puragiri (literally, citadel), and is now known as the Old Fort. Yaduraya built the first palace inside the Old Fort in the 14th century, which was demolished and constructed multiple times. The current structure was constructed between 1897 and 1912, after the Old Palace was burnt ablaze. The Chamundeshwari Temple is a Hindu temple located on the top of Chamundi Hills about 13 km from the palace city of Mysore in the state of Karnataka in India.The temple was named after Chamundeshwari or Durga, the fierce form of Shakti, a tutelary deity held in reverence for centuries by Mysore Maharajas. The Brindavan Gardens is a garden located in the Mandya District of the state of Karnataka, India. It lies adjoining the Krishnarajasagara dam which is built across the river Kaveri.The work on laying out this garden was started in the year 1927 and completed in 1932.Visited by close to 2 million tourists per year, the garden is one of the major attractions of Srirangapatna. Mysore Zoo (Now Mysuru Zoo) (officially the Sri Chamarajendra Zoological Gardens) is a 157-acre (64 ha) zoo located near the palace in Mysore, India. It is one of the oldest and most popular zoos in India, and is home to a wide range of species (168). Mysore Zoo is one of the city’s most popular attractions. While mainly depending on entry fees for its financing, an adoption scheme introduced in the early 2000s has been a success. Celebrities, institutions,animal lovers and Volunteers of various clubs in the zoo have contributed directly to the welfare of the zoo inmates. Krishna Raja Sagara, also popularly known as KRS, is the name of both a lake and the dam that creates it. It is located close to the settlement of Krishnarajasagara in the Indian State of Karnataka. The gravity dam made of surki mortar is situated below the confluence of river Kaveri with its tributaries Hemavati and Lakshmana Tirtha, in the district of Mandya. There is an ornamental garden attached to the dam, called Brindavan Gardens. St. Joseph's Cathedral is a Catholic church that is the cathedral of the Diocese of Mysore, India. The full name is the Cathedral of St. Joseph and St. Philomena. It is also known as St. Joseph's Cathedral.It was constructed in 1936 using a Neo Gothic style and its architecture was inspired by the Cologne Cathedral in Germany. This is one of the tallest churches in Asia. Karanji Lake is a lake located in the city of Mysore in the state of Karnataka, India. The lake is surrounded by a nature park consisting of a butterfly park and a walk-through aviary.This aviary is the biggest 'walk-through aviary' in India.There is also a museum, the Regional Museum of Natural History which is located on the banks of this lake. The total area of Karanji lake is 90 hectares. While waterspread area is about 55 hectares, the foreshore area measures about 35 hectares. Karanji lake is owned by the Mysore Zoo Authority.Mysore Zoo gets a revenue of an average of Rs. 50000 per day from ticket sales to enthusiasts who visit this lake. The Ranganthaswamy temple (usually referred to as "Sri Ranganathaswamy") in Srirangapatna, in the Mandya district of Karnataka state, India, is dedicated to the Hindu god Ranganatha (a manifestation of the god Vishnu). It is one of the five important pilgrimage sites of Sri Vaishnavism along the river Kaveri for devotees of Ranganatha. These five sacred sites are together known as Pancharanga Kshetrams in Southern India. Since Srirangapatna is the first temple starting from upstream, the deity is known as Adi Ranga (lit; "first Ranga").The town of Srirangapatna, which derives its name from the temple, is located on an island in the river Kaveri. Ranganathittu Bird Sanctuary, also known as Pakshi Kashi of Karnataka,is a bird sanctuary in the Mandya District of the state of Karnataka in India. It is the largest bird sanctuary in the state,only 40 acres (16 ha) in area,and comprises six islets on the banks of the Kaveri river.Ranganathittu is located three kilometers away from the historic town of Srirangapatna and 16 kilometres (9.9 mi) north of Mysore.The sanctuary attracted about 3 lakh visitors during 2016–17, which shows its notability as important bird sanctuary of India. Popular water park with slides, rides, multiple playgrounds & an old-fashioned carousel. Short, scenic waterfall stretching along a small dam, popular for wading & outdoor picnics. On the banks of Holy river Kaveri is a tiny tranquil town of Somanathapura. Here stands the finest and most exemplary monument of Hoysala architecture known as the famous Prasanna Chennakesava Temple or simply the Kesava Temple. Consecrated in the year 1258 CE, it is a Vaishnav Hindu Temple dedicated to might and beauty of Lord Krishna (Chenna= Beautiful and Kesava= Krishna). Tourists from near and far come to visit the temple to get a view of the beautiful place. The Chennakesava temple is one of the 1500 Temples built by the Hoysala Empire kings in different parts of their kingdom, and is said to be the climax development in Hoysala temple style and yet is unique in many other ways. A classic example of the famous Hoysala architecture, and is one of the three temples of the kind to be nominated in the Unesco World Heritage list. Unfortunately, this temple is no longer used as a place of worship because the idols have been broken and desecrated by the invading Muslim armies. However, the beauty of the temple still charms thousands of visitors who visit the site to witness the magnificent artistic and engineering achievements of the era, to seek the Lord's blessing and admire the delicate carvings and sculptures, whose beauty is unequal and as unique as the God that it houses. Recognized as the second tallest church of Asia, St. Philomena's Church was constructed to pay tribute to the Catholic Saint and martyr of Roman Catholic Church, Saint Philomena. It is one of the most important historical sites in Mysore and is frequently visited by tourists from all over the country. The church is beautiful and one of the most distinctive landmarks of the city. It looks even more beautiful in the evening sky and is given religious importance having a Neo-Gothic style of architecture which makes it all the more famous amongst masses. The foundation for the church was laid in the year 1933 by the then king of Mysore, Sri Krishnarajendra Wodeyar Bahadur IV for the European residents in the city. After the construction went on for about eight years, the church started functioning in the year 1941. The remains of Saint Philomena have been preserved here and are present even today. Saint Philomena was the daughter of the monarch of Greece and had always been a devotee of God and believed in him. She was taken to meet the Emperor when she was 13 years old, after which, the Emperor on seeing her beauty offered to marry her. However, she refused and the emperor ordered to have her executed. The church stands as a symbol of the secular viewpoint and the religious accord of Mysore. While in Mysore, take home Mysore silk saris, Mysore sandalwood artifacts and handicrafts, incense sticks, and traditional Mysore paintings called Ganjifa paintings, that the town is known for. Nestled on the banks of River Kaveri, the town of Talakadu in Karnataka is a mystic place submerged in the sand of extremely fine quality. Steeped with rich past and heritage, it is famous for its Vaidyanatheshwara Temple dedicated to Lord Shiva. The place derives its name from two local chieftains Tala and Kada and thus is called Talakadu. Situated only 3 hours drive from Bangalore, this is an ideal place for history buffs and for the devotees of Lord Shiva. With a rich past and heritage, the town is also quite famous among the devotees who come here for a special worship. Talakadu is situated on the left bank of River Kaveri and visitors can witness the legacy of the town that still reflects in its age-old antiquity. There are a number of temples located on the banks of River Kaveri that are buried under the sand and are excavated once in every 12 years for special worship called the 'Panchalinga Darshana'. The Panchalinga Darshana includes five major temples namely Vaidyeshwara temple, Arkeshwara temple, Vasukishwara or Pataleshwara temple Saikateshwara or Maraleshwara temple and Mallikarjuna temple. It is said that the Pataleshwara Shivalinga change colours according to the time of the day- red in the morning, black in afternoon and white in the evening. This ancient temple is located outside the Mysore Fort, the main deity being Trinesvara i.e. the three eyed Shiva. The gopura of this temple was destroyed in the 18th century, but the beauty of the Dravidian architecture is still on display here. The two temples in Melukote are Tirunarayana temple and Yoga Narasimha, both located at the foothills and top respectively of the Yadavgiri hills. Mysore is a temple town located on the banks of Kabini river. The temple is built in the Dravidian style. It houses three main deities, Lord Nanjundeshwara, Goddess Parvathi and Lord Vishnu with Sridevi and Bhudevi. During the procession of the chariot festival, shivalingas, mantapas and other idols are used. The temple built in 300-1000 CE during the reign of the Ganga dynasty. Later on, renovations were also done by the Hoysalas. That time the deity was called 'Hakim Nanjunda'. This name was being suggested by Tipu Sultan, when his elephant got cured through the prayers offered to the deity. From that day, the deity is considered as a healer among the worshippers and the devotees take a holy dip in the Kapila river after they are done with performing their rituals. They believe the ritual would cleanse them of their diseases. Lord Srikanteshwara is also known as Nanjundeshwara. Nanjangud also known as "Dakshina Kashi", is a town in Mysore of Karnataka that lies on the banks of the river Kapila, which is situated 23 km from Mysore.This city is also popular for a variety of banana that are grown in the region. The temple is built in the Dravidian style. It houses three main deities, Lord Nanjundeshwara, Goddess Parvathi and Lord Vishnu with Sridevi and Bhudevi. During the procession of the chariot festival, shivalingas, mantapas and other idols are used. The temple built in 300-1000 CE during the reign of the Ganga dynasty. Later on, renovations were also done by the Hoysalas. That time the deity was called 'Hakim Nanjunda'. This name was being suggested by Tipu Sultan, when his elephant got cured through the prayers offered to the deity. From that day, the deity is considered as a healer among the worshippers and the devotees take a holy dip in the Kapila river after they are done with performing their rituals. They believe the ritual would cleanse them of their diseases. Lord Srikanteshwara is also known as Nanjundeshwara. This temple built in the Dravidian style is dedicated to Lord Shiva and is said to have healing powers. The 125 feet tall Gopura along with the 7 gold kalash are a must see on visiting this temple. One of the more unique attractions of the Royal Mysore, the Bonsai Garden of Mysore is home to over a 100 different varieties of Bonsai trees spread across this vast estate. It is a part of the Avadoota Datta Peetham of the Sri Ganapathi Sachidananda Ashrama. Initially a pet project by the fascinated Swamiji, the garden now hosts 450 miniature tree across an area of 4 acres, filled with these quirky dwarf trees. The beauty of the garden is accentuated by the stream that flows within, as well as the placement of Buddha statues and monkey statues around the area, representative of the zen culture from where the art of Bonsai was evolved. There is also a deer park to cater to the nature lovers who visit. The garden and the exhibits have been divided into various zones within, representing different Indian traditions and beliefs as followed by the Swamiji. Thus, one can find plants with connections to the Indian zodiac system, Indian classical music, the representation of the 27 stars of traditional Indian astrology, the seven Indian sages or Saptarishi, and five plant gardens closely linked with the concept of the Mother Goddess. The garden is indeed a delight to walk through, and one can't help but appreciate the fine art and effort required to shape a 100-year-old tree within a lovely terracotta pot. This garden is also the venue for bonsai conventions held during December. These 3-day seminars see experts from different parts of the world conducting workshops on bonsai plants. 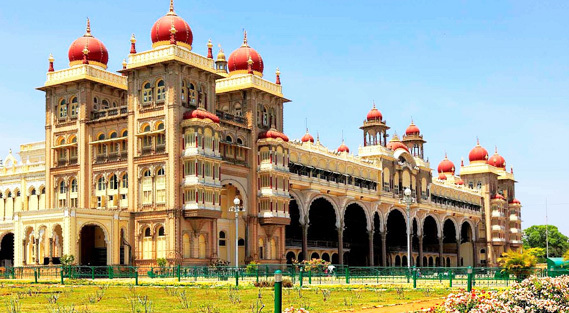 Built in the year 1921, Lalitha Mahal is the second largest palace in Mysore. It was built at the orders of Maharaja Krishnaraja Wodeyar IV of Mysore for stay of the then Viceroy of India. The architecture of the grand palace was inspired by St. Paul? Cathedral in London, making it one of the most remarkable structure to grace the landscape of the city. Home to over 2000 birds, the Shuka Vana in Mysore is a must visit for ornithophiles and nature lovers. With over 450 varied species, this striking 50m high aviary spanning an area of 1 acre currently holds the record for most bird species in an aviary in the Guinness Book of World Records. This unique park, commonly known as parrot park, is a part of the Avadhoota Datta Peetham in the Sri Ganapathi Sachidananda Ashram, and also serves as a rehabilitation centre for abused, injured and abandoned birds. One can find many rare species of parrots flying around this beautiful enclosure. The revered seer of the ashram, Sri Ganapathi Sachidananda Swamiji believes that birds are vital to the existence of other species, and their diminishing numbers in recent years have been a cause for alarm and a call to action. Through this initiative, he hopes to inform, sensitise, and grow a sense of respect and friendliness amongst the general public towards the avian species. Parrots here have been assigned as per the zodiac signs they are connected with, and one can find a parrot that represents their birth date and planet as per Indian astrology. Parrots here can also be found to symbolise days and months of the year. It is quite impressive to observe a large number of these delightful creatures, considered vessels to invisible spirit dimensions. Landmark historic clock tower with a fountain, set amid a bustling food & craft market.This property in Mysore offers a good value for money to its patrons. Thonnur Lake is a picturesque excursion site, located about 30 kilometres away from Mysore. It was once referred to as Moti Talab by the mighty ruler of Mysore, Tipu Sultan. This was because its water was so clear that every pebble in the lake could be seen from above. The lake is spread across 2000 acres and is used as a tank to collect rainwater for irrigation. Surprisingly, it never runs out of water even if there is no rainfall. The lake and its surroundings (including rocky hills and tall trees) together make it a scenic spot. It is among those places that are not known to many tourists; however, locals are often seen here picnicking with their friends and family. Mysore Zoo is a 157-acre zoo located near the palace in Mysore, India. It is one of the oldest and most popular zoos in India, and is home to a wide range of species. Mysore Zoo is one of the city’s most popular attractions.